This post is excerpted from the original I published in 2007 at my site Family Rambling. In November 2005 Brenna had just had her first birthday, and Doug and I our second anniversary, so we packed up our small family for our first family trip to Ireland. We landed at Shannon Airport shortly after 9am. I had been in contact with our first B&B and knew that, if necessary, we could check in early. Which was a Godsend as we were exhausted. Bunratty Meadows was easy to find just minutes from Shannon Airport and just what we needed after our long journey. Dariena Sutton was ready for us and had a cot (Pack & Play) ready in our room. I had shipped a box of necessities ahead and that was in our room, also (see note at bottom of post). The room was spacious, with two comfortable beds and an ensuite bath with a shower. 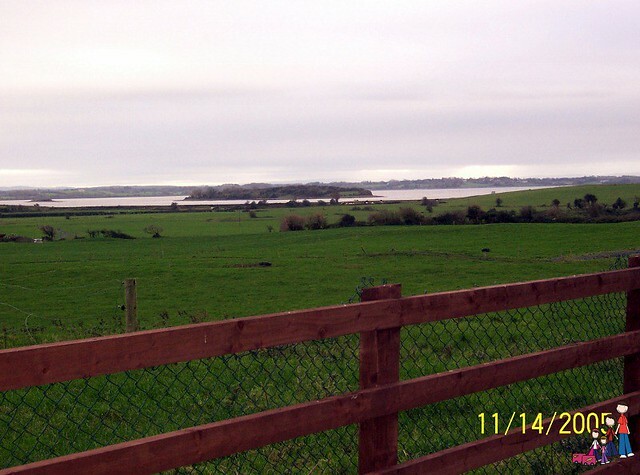 The house sits back from the main roads and is quiet and peaceful with a beautiful view of the River Shannon Estuary. After our rest Dariena had fresh scones and coffee awaiting us in the dining room. She was very friendly and answered all of our questions, both about the area and her B&B. After the delicious snack we set off for nearby Bunratty Castle where Brenna explored her first castle, carried sticks (because sticks are fun no matter where in the world you are) and had a few giggles on the swings in the play area. Later that evening after Brenna had gone to bed we were able to access the internet, which is included in your room fee. There is also a TV in each room or a guest’s lounge if you wish to mingle with others. Bunratty Meadows boasts an extensive breakfast menu and everything we had was wonderful. Don’t let the thought of black pudding scare you- it is delicious- and I can never get enough of the brown bread. Doug had the Burren smoked salmon with scrambled eggs and raved about it. Cereal and yogurt were available for Brenna and Dariena made her freezer available to use for ice packs for the day’s travels. Bunratty Meadows is a terrific B&B, the perfect spot for your first night, your final night or as your home base for the western counties. Note: If you travel by plane and you know you will need items that you cannot easily obtain at your destination inquire about sending them so they will be there for your arrival. Dariena Sutton was happy to hold our box of necessities: diapers, wipes, disposable cups, plates, dishes, toddler snacks & food, etc. Your luggage will be full enough without carrying these items and you can dispose of them before you head home.